What is more important, the letter of the law or the truth? Facts or outcomes? Is it acceptable to lie and cheat your way through the process if the eventual result is moral and just? These are the big questions Suits attempts to tackle in “Yesterday’s Gone,” from multiple angles and with uneven results. The more straightforward take on the concept belongs to Jessica, who finally gets a story with some meat on its bones as she has to deal with her ex-husband Quentin’s death and what will happen to the drug company he founded. Will it be sold off to a competitor, or continue to exist on its own with the mission of curing the ALS he died from? We haven’t seen or heard from Quentin since season one, so I must admit I barely remembered he existed. Still, Gina Torres manages to convey enough shared history with the character through her performance that it eases the initial shock of spending so much time delving into the desires of someone we barely knew but are obviously asked to connect with emotionally. Torres’ performance allows for a shortcut that most likely shouldn’t be there. The facts of the case are less interesting and as is Suits’ style, mostly exist to illustrate things about Jessica rather than saying anything essential about the law or taking a more universal aim. As most cases on Suits usually do, it starts with Jessica convinced she is the only person who knows what is right—and she’s certain selling the company to a competitor will kill all of Quentin’s research and ruin the progress in curing ALS he dedicated his life to making. What starts out as a petty squabble with Quentin’s current wife (the always welcome Sharon Leal) turns into the two women working together to ensure his legacy doesn’t die along with him. Where Suits turns this into a bigger question—a question I’m still not sure the show is prepared to answer—is in Jessica’s handling of how she argues the case. It all comes down to the issue of how mentally capable Quentin was when he signed executive power over to Jessica. Jessica knows he was starting to fail both mentally and physically, knows that the letter of the law is against her, but argues that intent is more important than legality in this case, and wins. Quentin’s intent was to keep his company strong and robust and continue his work, and Jessica plans on doing that—whereas her challenger plans to sell—and on this basis, she wins. Is there a legal precedent for this? Honestly, I am not sure, but I’m not sure that’s the important question here, as this show is always less interested in the law itself than it is in those who practice the law. With Jessica’s story, it works. Where it feels like Suits isn’t as prepared to answer these bigger questions is when it conflates Jessica’s dilemma with Mike’s, muddying the waters and making everything a bit less clear. Revisiting Mike’s (and Harvey’s, and Jessica’s, and Donna’s, and now Rachel’s) big lie this season could have been a groaner but was redeemed by giving Mike the ultimate adversary: Louis. Louis is the perfect foe because the giant, pretentious, smoke-blowing farce that is Pearson Specter’s Harvard policy is like lifeblood to him. Believing in the “pristine” Harvard pool of talent at this firm validates Louis as a descriptor of himself and of the associates he molds, in a way it doesn’t really fuel anyone else on the show. Roll that together with the idea that Mike did something unethical and this is exactly the type of thing Louis would care deeply about and take upon himself to champion. 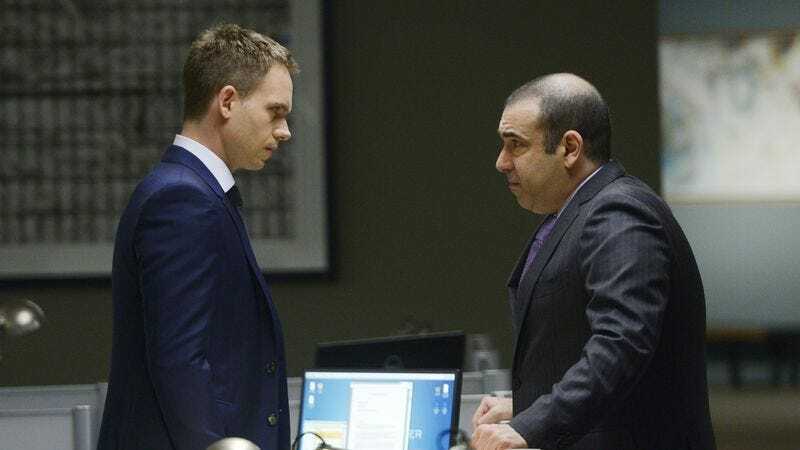 It also helps that Louis is a great character and Rick Hoffman infuses him with such empathy, making Louis easily relatable even when his personality tends towards sniveling rather than sympathetic. The problem with Mike’s lie has always been what the show wants us to think about it, and at this point it is entirely unclear what that might be. Does the show view this lie as unethical, or is it now a necessary evil? Have all of the clients Harvey and Mike have helped along the way made up for the fact that his very existence in the firm is untenable? 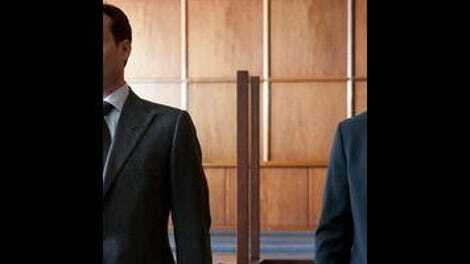 Or is Suits boldly daring us to form our own thoughts, simply by presenting these as choices the characters make and allowing us to make up our own minds? As the lie rages on and on without any real consequences for Mike including in this episode, where Louis’ inquiry is easily wrapped up in a nice little bow, it gets harder and harder to tell which of the above scenarios is in play. One interesting beat of the story in this episode is how Mike’s dilemma affects Harvey. Harvey is a man who is used to bullshitting his way through his life and his profession—bullshitting for a purpose, you might say. The art of the bluff is his biggest and best trick, until he uses it on the one person it appears not to work on: Harvard ethics professor Henry Gerard (played by Gabriel Macht’s real-life father, Stephen). There’s obviously no love lost between the two, and Harvey’s failed attempt to manipulate him is the one time he’s looked truly stumped on this show. Gerard instructing Harvey that “compromising your way in life is no way to go about the law” is telling about what this episode wants to say about how everyone at Pearson Specter practices law. Are all of these compromises worth it, or are they chipping away at everyone’s soul? What exactly are Mike and Harvey losing by continuing to perpetuate this charade? These are the bigger questions it feels like the show isn’t quite ready to embrace, and why the resurfacing of Mike’s big lie ultimately again feels more like a distraction than an essential moment. In the end, Mike and Harvey win because of promises of implied friendship to Louis, coupled with a little more manipulation. After all of the interesting questions posed, it seems like a reductive conclusion to what had the potential to be a much more emotionally complicated story. Mike’s “if I had to do it over” speech to Louis was the one moment of this episode I honestly believed he was sorry for what he’s done. If Mike had his life to do over, he would do it right this time. I truly believe that. But is that enough? I’m really not sure how I feel about the scene where Rachel goes to Louis and asks him to let Mike slide. Rachel feels like she should be a stronger character than she’s being presented this season (which is mostly as “Mike’s girlfriend” so far, which, yuck). Last week, Scottie’s introduction to the firm was the biggest story. This week, Scottie was only talked about by Harvey and Donna and not seen. Interesting choice, that. Margaret Lyons wrote a very funny list of “The Seven Things That Happen On Every Suits Episode” for Vulture, and I had to laugh when Gina Torres and Sharon Leal spent multiple scenes together in this episode…talking about what their dead ex-husband’s life goals were. Number seven indeed! “A new beginning deserves a new bed.” Is this a thing?